What better reason do you need to throw a dinner party than a chance to support Marie Curie nurses and those suffering from terminal illness? Last weekend my recipes for a retro-inspired dinner as part of the Marie Curie Dinner Down Memory Lane initiative appeared in Waitrose Weekend newspaper. I’m putting them up here on my blog to encourage you to throw a party this November for this really good cause. And I’ve added a veggie alternative to the main course and a short time plan. It’s a great menu for a party as almost all of it can be prepared in advance so you could do what I am planning and get the whole lot done well in advance. On the night all you need to do is heat the oven to cook the beef, cook vegetables and griddle the prawns, and dig out your flares and tie die…. 1 Mix the prawns with the garlic, lemon slices, chopped chilli, 2 tbsp olive oil and seasoning together in a bowl. Cover and chill. Mix the chopped onion, tomatoes, and vinegar with seasoning for the salsa, cover and chill. 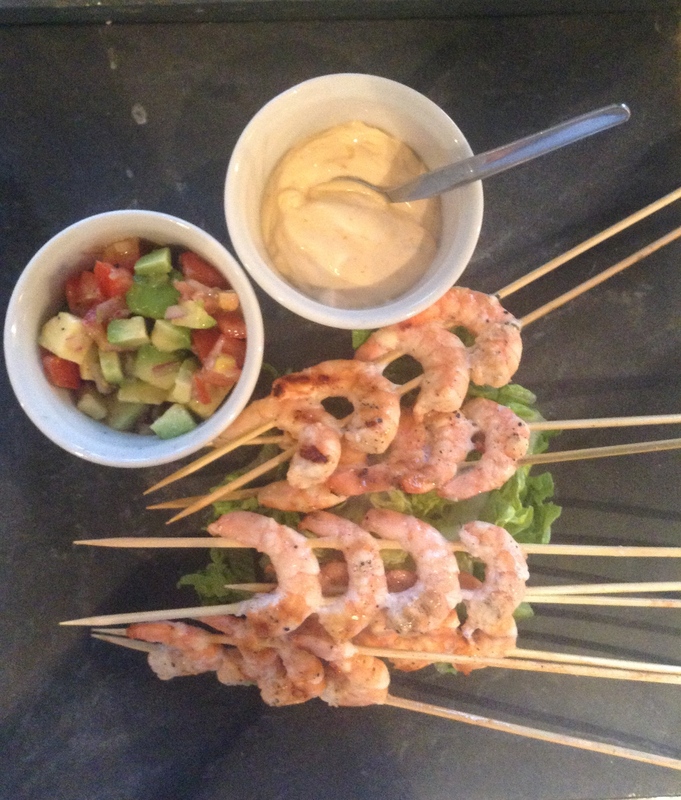 2 When you’re ready to serve the prawns peel, stone and chop the avocados and add them to the salsa with the basil. Check seasoning. Flavour the mayonnaise with the tomato puree and Tabasco. 3 Preheat a griddle pan, thread the prawns onto wooden skewers in threes or fours and cook the prawns for 1-2 minutes on each side until completely cooked through. Arrange the shredded lettuce on serving plates, top with the prawns and serve with the salsa and mayonnaise in small bowls. Fillet is expensive but really makes this dish special. Prepare ahead and chill in the fridge until needed and don’t forget to rest the meat after cooking for the best result. 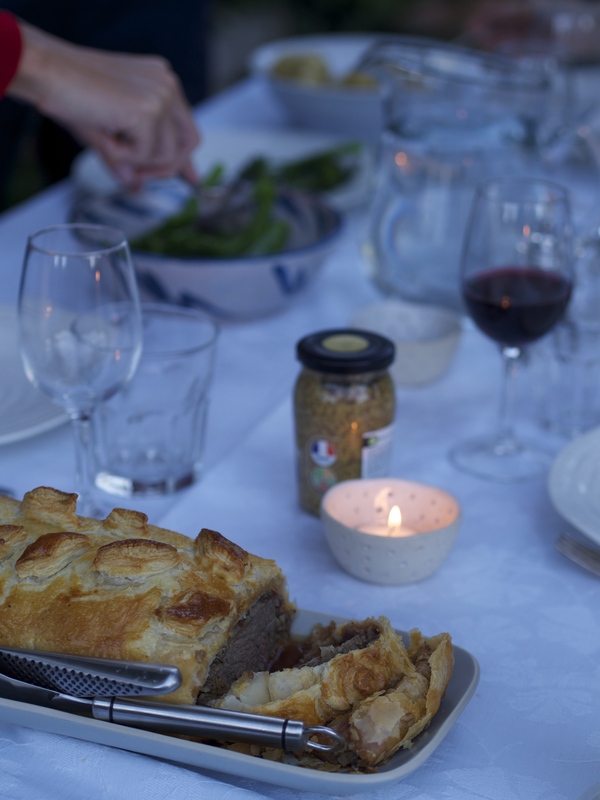 I will be having my own retro dinner party to raise funds for Marie Curie at the end of the month and am doing a veggie en croute alternative as well – see the recipe below. 1 Heat the oil in a medium frying pan and fry the fillet of beef on all sides until well sealed and browned. Remove from the pan and set aside until cold. Add the onion and garlic to the pan and cook gently for 3 – 4 minutes until soft then add the mushrooms and continue cooking for a few minutes more. Remove from the heat and mix in the thyme and plenty of seasoning. Leave to cool completely. 2 Roll out the pastry to a rectangle large enough to enclose the beef. Spread the tomato paste over the pastry leaving a 5cm rim then lay the pancetta slices over the top. Spread the mushroom mixture over the pastry and place the fillet in the centre. 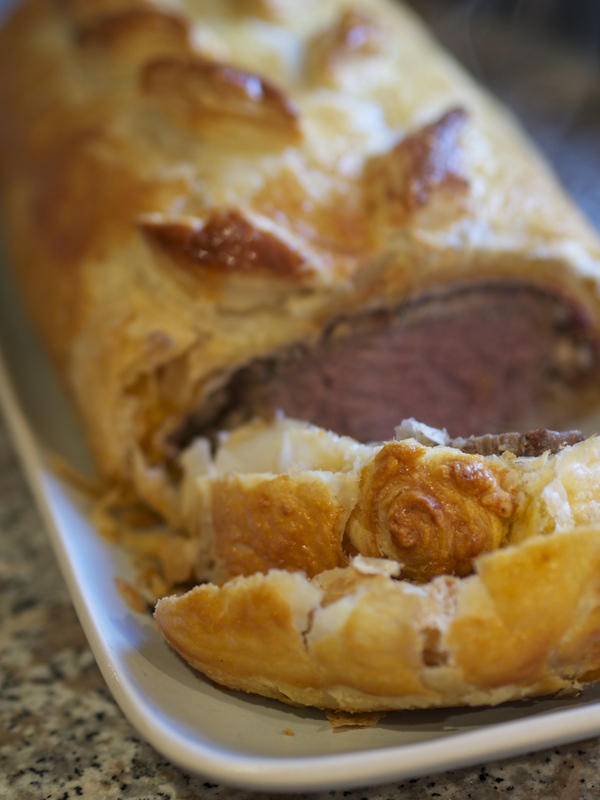 Brush the pastry edges with cold water then wrap the beef in the pastry to form a neat parcel, tucking in the edges. Place on a greased baking sheet with the seam underneath and decorate the top with leaves made from the pastry trimmings. Make a couple of slits in the pastry for steam to escape. Chill for 15 minutes or until ready to cook. 3 Preheat the oven to 220C Gas mark 7. Brush the pastry with beaten egg and bake in a hot oven for about 40 – 45 minutes for rare beef, until the pastry is golden. For medium or well done lower the oven to 180C gas mark 4 and cook for a further 10 – 20 minutes. Leave to rest for at least 10 minutes for the beef juices to rest before cutting and serving in thick slices with new potatoes and steamed green vegetables such as French beans or broccoli. 1 Soak the porcini in boiling water for 15 minutes then drain and chop the mushrooms. Melt 25g butter in a large saucepan and fry the shallots and garlic gently for 5 minutes until soft. Add all the mushrooms and cook over a high heat for 3 – 4 minutes until golden and just tender. Off the heat, stir in the Madeira, thyme, chestnuts, pine nuts and seasoning. Leave to cool. 2 Preheat the oven to 200c gas mark 6. Steam the spinach for 2 minutes until wilted then squeeze out any water. Melt the remaining butter. Lay a tea towel on the work surface. Arrange two sheets of filo on top with the longest side closest to you, overlapping by 5 cm. Brush with a little butter (don’t over butter as it will be too rich) and add two more layers of two sheets of filo, buttering as you go. 3 Spread sun dried tomato paste over the pastry leaving a 5cm gap around the edge. Arrange the steamed spinach over the top. Spoon the mushroom mixture over the spinach. Fold in the shorter ends over the filling, and then bring the long edges together to overlap and make a flat parcel. 4 Carefully lift the parcel onto a large baking sheet and brush with remaining butter Bake for 25 -30 minutes until crisp and golden brown, covering loosely with foil if it browns too quickly. Serve in slices. Note: You can make six individual parcels from the sheets of filo following the same process. Bake them for 18 – 20 minutes. 1 Preheat the oven to 170C Gas mark 3. Mix the crushed biscuits with the melted butter and press into the base of a 20cm (8in) greased and base lined spring-release tin. 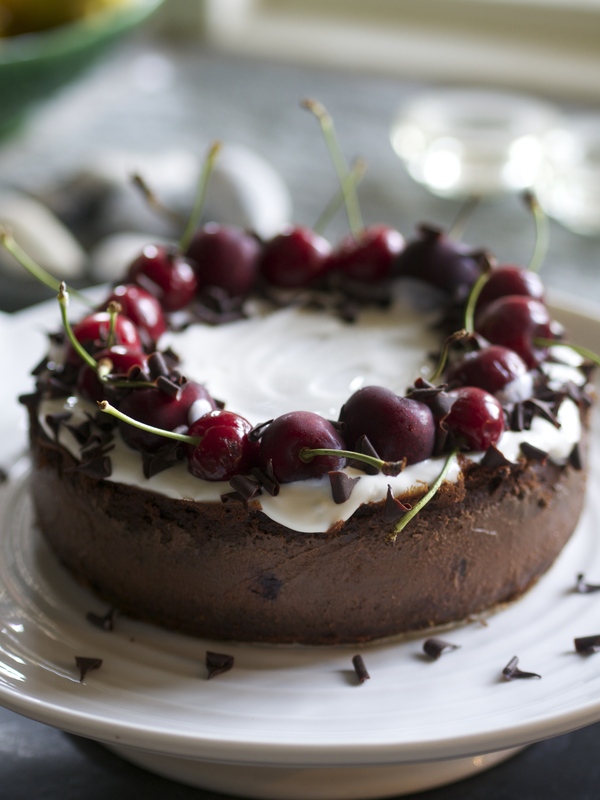 Arrange two thirds of the stoned cherries over the base. 2 Beat together the soft cheese,and sugar until smooth, then gradually beat in the eggs and egg yolks. Melt the chocolate with the cream and cocoa in a small pan over a very low heat and stir until smooth and cream. Cool then fold into the cheese ingredients. Spoon into the tin and level the surface then bake for 35 – 40 minutes until only just set. Turn off the oven and leave the cheesecake to cool in the oven for a couple of hours then remove from the oven and chill for at least 2 hours. Prepare the beef to the end of step 2. Or make the filo parcel to the end of stage 3. One hour before serving heat the oven. Decorate the cheesecake. Put the beef into cook in the preheated oven. 10 minutes before serving cook the prawns then cook the vegetables and keep warm. Rest the beef while you serve the starter. This entry was posted in Recipes and tagged 70s dinner menu, 70s retro dinner party, beef en croute, black forest cheesecake, chocolate cheesecake recipe, Dinner down memory lane, marie Curie menu, prawn cocktail, Waitrose weekend. Bookmark the permalink.